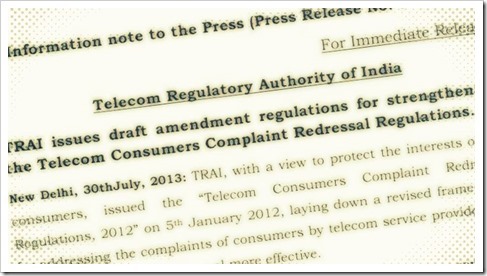 In January 2012, Telecom Regulatory Authority of India (TRAI) had brought a change in consumer complaint redressal system. They had asked all operators to implement “web based complaint monitoring system” to monitor their complaints. In the event that customer was not happy with the redressal of his complaint, they could directly approach the appellate authority for redressal of their complaints. However, TRAI has found consumers are still not aware of this system, and there was a need to further improve the complaint redressal mechanism. Apart from lack of awareness of consumers, they also did not know about the procedure of the appeal to appellate authority. A mobile consumer can directly launch a complaint to appellate authority through telecom operators existing consumer care number. If the consumer files a complaint, the telecom operator has to intimate the consumer on the action taken as well as let them know the procedure for appealing to appellate authority, incase they are not satisfied by operator’s complaint redressal. Upon disposal of the appeal by the appellate authority, the details are to be communicated to the appellant through SMS or e-mail or post. Telecom operator has to make the complaint center accessible to its consumers in person as well as through voice call, SMS, E-mail and post. Currently these provisions are put across for consultation with stakeholders and will be incorporated formally after the consultation process is over!